India's most famous attraction, the Taj Mahal, is under attack by some members of the country's ruling party. The most recent attack came from Sangeet Som, a lawmaker from the Bharatiya Janata Party, or BJP. According to Som, the monument is "a blot on Indian culture" that was built by "traitors." This isn't the first time that India's Islamic past has come under attack by members of the BJP or other Hindu groups. In Uttar Pradesh, India's most populous state, the government removed the Taj Mahal from its official tourism booklet. The booklet was published earlier this month. The federal government, led by Prime Minister Narendra Modi, has been accused of trying to change history textbooks – especially India's past of Muslim rulers. Som's comments drew criticism from federal lawmaker and Muslim leader Asaduddin Owaisi. He asked if the government would urge tourists not to visit the Taj Mahal and other monuments built by India's former Muslim rulers. The BJP distanced itself from Som's comments. The party's general secretary, Vijay Bahadur Pathak, said the Taj Mahal is part of Indian pride. "Whatever Som said is his personal view. BJP has nothing to do with it," he noted. 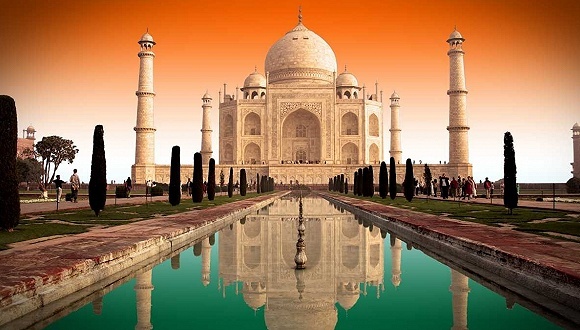 Mughal Emperor Shah Jahan had the Taj Mahal built between 1632 and 1654 for his favorite wife, Mumtaz Mahal. He planned on being buried with her. The Taj Mahal complex has their graves as well as several other graves of lesser Mughal royalty. The monument is India's top tourist attraction. It draws some 3 million visitors every year. The town has been under attack by rebel groups for a week now. They both played the game according to the rules. Voters wish to register their dissatisfaction with the ruling party. 5. "Whatever Som said is his personal view. BJP has nothing to do with it," he noted. I see, you think this has nothing to do with you. I told him this has nothing to do with clark. 6.The Taj Mahal complex has their graves as well as several other graves of lesser Mughal royalty. urgevt. 驱策，鼓励，力陈，催促 vi. 极力主张 n.